Sirius Day Spa brings customizable relaxation to the Valley with an all-inclusive membership. 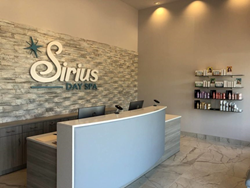 The first Sirius Day Spa location has opened in Scottsdale, Ariz., at 8877 N. Scottsdale Road, Suite 404. As a Sirius Day Spa member, you will enjoy a high-quality Day Spa experience that incorporates luxurious services at an affordable monthly membership price, all within a tranquil environment. Sirius Day Spa offers customized facials, diamond microdermabrasion, body waxing, manicures, pedicures, massages, infrared body wraps, mud wraps, teeth whitening, blowouts, eyelash extensions, resurfacing micro-peels, and more, all designed to leave each member radiant, refreshed, relaxed and rejuvenated. Sirius Day Spa is operated by The Leonesio Group (TLG-SDS, LLC) who uses John Leonesio's franchise formula to create successful, rapidly growing brands. This franchise formula was the same used at Massage Envy, The Joint, and other successful franchises developed by Mr. Leonesio. Sirius Day Spa has sold 289 regional developer licenses through 2017 and expects locations throughout Texas, Minnesota, Georgia, Florida and Arizona to open by summer 2018. Interested franchisees or regional developers should contact info(at)siriusdayspa.com, call 888-778-6747 or go to SiriusFranchise.com, to find out more. For more information on visiting a Sirius Day Spa, please go to SiriusDaySpa.com.